A brief history about Grand Rapids' favorite son, Gerald R. Ford. 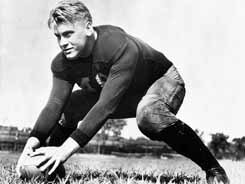 Gerald R. Ford, in the eyes of Grand Rapids, was the epitome of an all-American boy from a middle class, Mid-western family. An Eagle Scout and a handsome football hero at South High School, he went on to the University of Michigan to continue his football career and earn a law degree. After serving in World War II he entered politics and ran, as a Republican, for the House of Representatives. He won and served the 5th district from 1949-1973 when a unique set of circumstances placed him in the White House. Spiro Agnew, President Nixon’s Vice-President, resigned in 1973, and Ford was selected to replace him. Then in 1974 Nixon resigned over the Watergate scandal and Ford became the unelected, 38th President of the United States. He died December 26, 2006 at the age of 93. After the state funeral at the National Cathedral in Washington D.C., his body was returned to Grand Rapids. Citizens lined the streets for miles as the cavalcade passed slowly throughout the city to his Presidential Museum. In the cold January weather, in lines that stretched the across the river from the museum, often reaching as far as the Convention Center, families, boy scouts, veterans, and individuals all waited quietly to pay their respects and say good-bye to the city’s favorite son. Grand Rapids had a genuine affection for Gerry Ford; it is appropriate that he came home to rest on the banks of the Grand River.